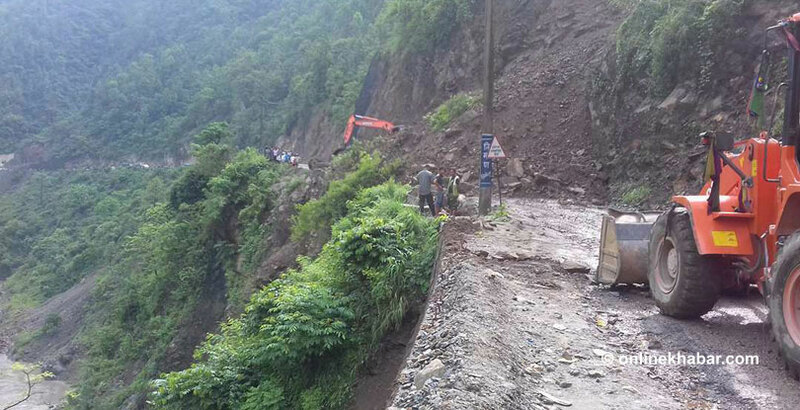 Ratnanagar, Chitwan – Narayangadh-Muglin road section has been obstructed due to landslide at Chepangdanda of Ichchhakamana rural municipality-6 in Chitwan district. Chief of Traffic Police Office, Chitwan, Bed Prasad Gautam, said that the vehicular movement along the road section has been closed from 9:30m am today due to the landslide. He said that efforts are on to remove landslide debris with the help of an excavator. Vehicles to and fro to Chitwan have been stranded there due to road obstruction.